Without being able to see the spot, I can only take an informed guess. My suspicion would be that the spot of discoloration is growth of a bacteria and/or mold. Has your son added any food to the farm? Adding food can cause molds or bacteria to grow more quickly. Even without added food, the ants bodies/by-products can start a bacteria or mold colony growing in the moist, nutritious gel. Sometimes the contamination can simply come from particles in the air that land on the surface. In any case, if your son’s ants are not too active, you might want to try scooping out the discolored area as much as possible with a clean tool. 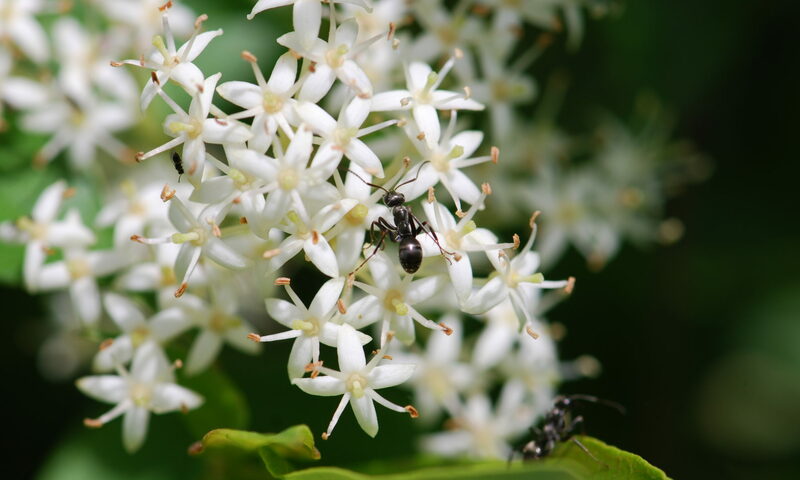 If the ants are active and healthy, they may try to remove it themselves. You can also wait and see what happens. It’s possible the mold or bacteria will not harm the ants, or the ants will not survive long enough for the spot to become an issue. 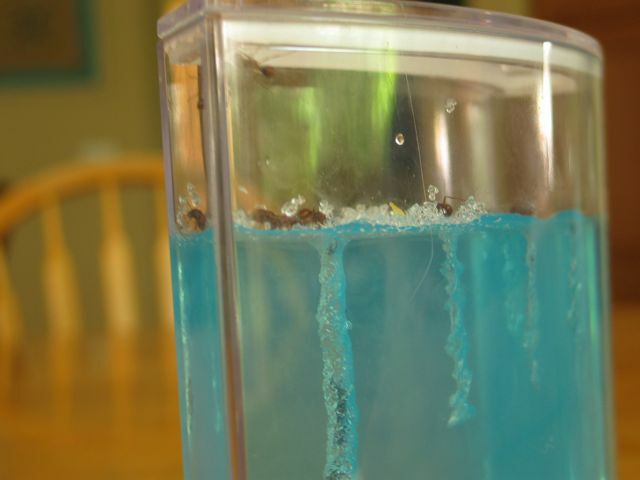 The blue stuff is a gel that was developed for an experiment to send ants into space. Although it was really meant to keep ants alive only for a couple of weeks, it is now sold as an ant farm. I have an ant farm.Only hade it 5 days now.I noticed tiny red spots in the sand.They have had only teeny pieces of bread and a small amount of water.Could you tell me what the red spots are. I am afraid I can only guess what it might be. One guess is tiny red mites, which can get on ants. I got a photograph of one riding on an ant recently. If I get it posted, I will share the link here. Sorry it took a few days to get back to you. If they aren’t mites, and you are still interested in finding out what it is, could you let me know if it has changed at all? The first ant in this post has a red mite attached to it’s leg. Is this what your red dots look like?